It has two sets of top rope anchors for dry tooling practice. brushing before any rock climbs can be enjoyed. Steep crack with committing moves to DB belay LHS of buttress. 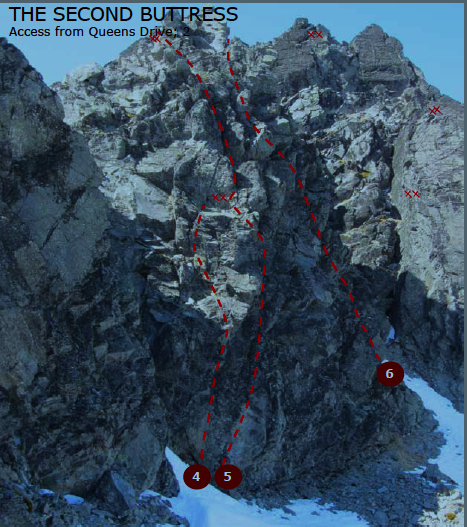 a direct finish from the start of the second pitch of Arian Supremacy; Above the belay ledge at 30 metres, the route heads directly for a roof with ‘awesome hooks,’ and then towards ‘easier ground’ on snow to the double bolt belay. The double bolt belay was installed by Jono Clarke by traversing in from the gully. He then cleaned all the loose rock off pitch one and left the route for someone else to claim. During the 2015 Ice and Mixed Festival Daniel Joll told us to climb the first pitch for the learning to lead clinic, and I fell off at the crux before getting up on the second try. We went back a few days later to climb both pitches. Dan reckons the protection is good, but as a novice trad-climber, I didn't find many good placements for pro. The right most crack and corner on the first buttress. Climb the corner on good protection to a double bolt belay. Follow Gully tending right for 8m, through right facing corner. Belay in small alcove, DB Belay, or exit right to ridge -Joll. Left hand exit via wide crack (M4 variation) -Addis & Scott.